Theocracy as explained in the popular selling book The Mormon Conspiracy provides a history of the Mormon Church whose early leaders, Joseph Smith and Brigham Young, were virtual dictators in their thirty nine year control of the church. In their theocracy, within the United States and its territories, they developed their own government and organized their own militia. Documentation and evidence is presented that shows that the Mormon Church theocracy reveals plans to control the United States government, and eventually the world, by establishing its “Kingdom of God” on earth. The words “Kingdom of God” are in quotes, as it is not a Kingdom of God that the Mormon Church wishes to establish, but a Kingdom of the Mormon Church, led by fifteen men, the Presidency (three men) and the Quorum of Twelve apostles of the church. The Mormon Church is an authoritarian organization much like the Monarchy that prevailed in such European countries as France and England before the French Revolution and before a democracy was established in England. The leadership of the Mormon Church theocracy requires religious obedience from members and teaches them that individuals need not think for themselves concerning church doctrine as taught by the Church Authorities. Even in areas of non-church affairs, such as politics and economics, the church hierarchy expects members to follow its directions. This is shown by the church’s involvement in defeating the Equal Rights Amendment in 1982 as well as in numerous other church-led political activities. In addition, the church has disproportionate influence in such governmental departments as the FBI, the CIA, and the FCC (Federal Communications Commission). Mormon theocracy regards the President (or Prophet) of the church to be infallible, and they believe that he has direct communication with God, therefore can do no wrong or make a mistake. Members believe that Church Authorities (fourteen apostles in addition to the president of the church) are also infallible. There is no democracy in the decision making of the church, since all appointments from the highest to the lowest offices in the church are made under the umbrella of the church president. If the Mormon Church were to gain control of the United States, there would be no secret ballot election of congressional representatives, no secret ballot election of state legislators, nor for local governmental officials. All of these officials would be appointed by the President of the Mormon Church, with assistance from other church officials. It is ironic that the Mormon Church that plans to control the United States and world governments is based upon false premises. 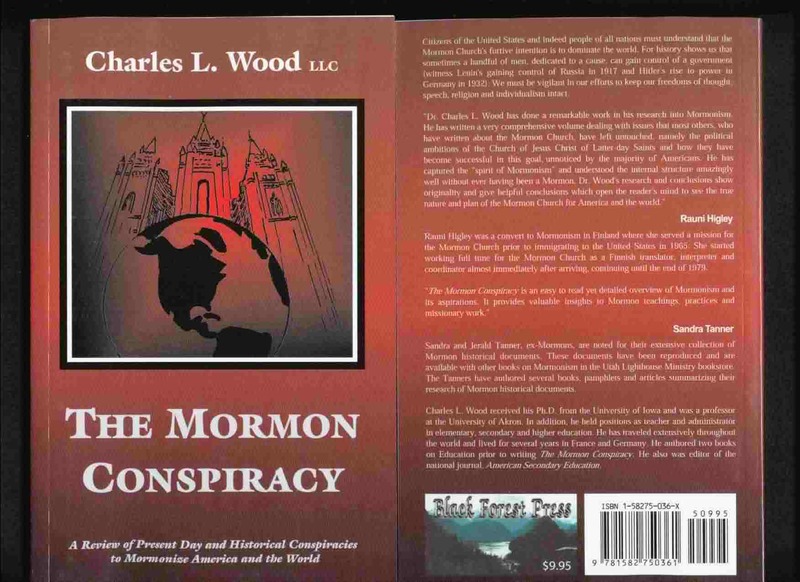 The Mormon Conspiracy has a review the documentation that proves the fraudulent nature of the church, and begins with an analysis of Joseph Smith’s Book of Mormon. This book is claimed by the church to be the only true gospel and although the church uses the King James version of the Bible, it is asserted by them to have been altered by man over the centuries. The Mormon Church began its history with a conspiracy by Joseph Smith to fool the local people with his book. This has continued to the present day with the church hierarchy continuing to hide non-faith promoting documents and teaching members not to read such materials. Documentation further reveals that some of the church’s beliefs and doctrines (mostly written by Joseph Smith, the church’s founder and first president) are fraudulent. The organizational and functional aspects of the plan to control the United States are already in place in many Mormon communities. Doctors, dentists and lawyers in these communities are overwhelmingly members of the Mormon Church. They have been indoctrinated from birth in the tenants and beliefs of the Mormon Church, and many attended Brigham Young University where further indoctrination occurred. Many of these professionals are assuming leadership positions in the church and are ready to take on additional responsibilities if “called” by the church hierarchy.